Although the plutonium production plants at Hanford would eventually use graphite as a "moderator" to slow and control the fission process, Manhattan Project officials also pursued heavy water as an alternative option. 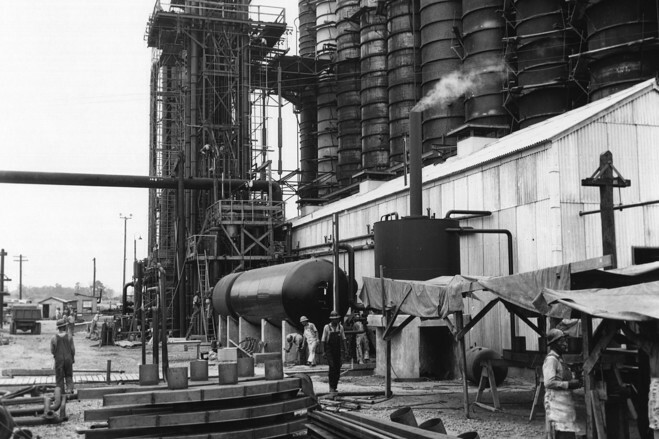 A feasibility report conducted by the DuPont Company in November 1942 also rated heavy water as an acceptable cooling system, second best only to helium. This information was brought to the attention of Harold Urey, a Manhattan Project scientist who had won the 1934 Nobel Prize in Chemistry for his discovery of deuterium, an isotope of hydrogen. Urey imagined a nuclear chain-reactor pile built as a “homogeneous” system with heavy water as both the moderator and cooler. It could function with a simple pump device, a much simpler design than the complex helium-cooled graphite pile. Urey believed such a pile could be built with only 10 tons of heavy water. The Manhattan Project soon contracted DuPont to build heavy water plants at three sites where ordnance works were already under construction: the Morgantown Ordnance Works near Morgantown, West Virginia; the Wabash River Ordnance Works, near Newport, Indiana; and the Alabama Ordnance Works, near Sylacauga, Alabama. For security reasons, the plants had to be administered directly by Manhattan Project officials while the Ordnance Department was, according to Colonel James Marshall, “not to be involved in the design or knowledge of use of the product.” The three plants would collectively produce three tons of heavy water per month. Construction at the Morgantown Ordnance Works started on January 7, 1943 and was was fully completed on December 31, 1943. The Alabama Ordnance Works, similar to the one built near Morgantown.